Still bitter and jealous that Octo got chosen as the official shape of Battlestar Galactica, despite numerous protests by Square’s agents and lawyers. The humongous boost in fame it received because of both Tetris and the inventions of Mr. Rubik, but hating that its name still became associated with being uncool. It’s constant gloating that not only can’t you tile a floor with only Octagons (unlike with Squares), but when you try, Squares are still needed to fill in the gaps. Being better and faster at doing summersaults than any other shape in school. The scientific, and highly coveted, process of determining the winner between these two shapes, begins now. Your votes, and only your votes (we do not accept bribes) will be used to determine: What is the greatest shape? Octagon wins easily...has more sides and UFC matches are fought in them. case closed as far as I'm concerned! Square is like the jealous little brother who wish he had so many 'sides' to his personality as Octogon does. (see what I did there?). 'Octogon' was one of those early cool Chuck Norris movies. kids are into these days. Square is just...like...'square'. I just finished sharing a donut and stiff drink with septi-whatever. Frankly, I don't have enough Prozac to keep fighting for the losers. I hate to complain further, but where'd you guys get these donuts? They're a bit stale. I have to throw my vote for Octagon. It's just a smoother shape and so much cooler to hang with. Robyn, I'll be honest with you, I haven't liked donuts in years unless they are stale. Any donut left out in the air to dry out for three days... that's my kind of donut. I'm kind of a square so I gotta stick with what I know. Octagons are too cool for me. Kal, though I'm surprised you chose the one that favors Octopuses. Eight TWINKIES are good. Eight TENTACLES are bad. It's all in the presentation. 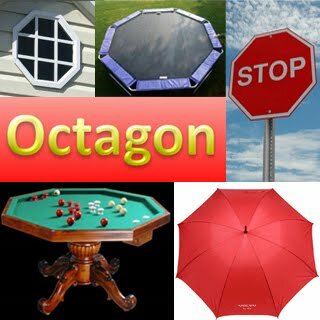 Every time I see the word octagon, one image burns through my brain. It's those massively puffed up lips on that nutjob "Octo-mom." My grandma always said "you are judged by who you associate with." So as much as I'd like to pick octagon. I can't! 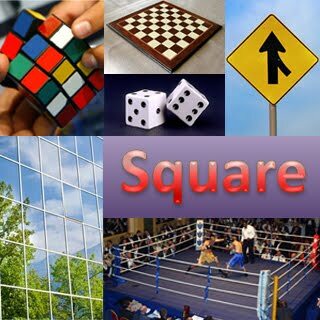 Square is a classic! How can you compete with it? It is the basis for every PopTart® for Godsakes. Octagon wins uniqueness points! Square is so...pedestrian. Okay, here's the be-all-end-all on this one. The octogon is cool, especially that they have made it into the MMA standard stage (just another in a long line of shape-envy of square) but no matter how you turn it is always and forever an octogon. The square (in addition to again, being what I consider a prime shape) has a super power...it can morph in a two-dimensional diamond shape by simply shifting 90-degrees! Totally the coolest even of any of the other prime shapes. See the merging sign and the 6-die in the pictures above. Square, simple yet powerful wins hands down. Not quite, though, copyboy. I think pop tarts are rectangles. But there are four sides to every story. I just want to say that I miss the allure of the Rubix Cube. I guess I'll go for the Square then. @ Pat.... DANG YOU! i was going to say the same exact thing. betcha didn't see that one coming, did ya? We are once again left with a tie, and therefore I must jump in to break it at the last minute. I would rather chop off my left long toe (the one next to the big one) than vote in a battle I'm officiating, but since we can't have a tie, I am without an option. So, I have to stick with the classics and throw my vote towards the Square. I've got to go with the square.